STRATTEC Security Corporation has been supplying locks and keys for the automotive market since vehicles were invented. This Milwaukee, Wis., company is a worldwide leader that has driven the innovations in its field, including the move from mechanical to electromechanical systems in automobile locks and keys. When it needed to improve its lead-times to keep up with demand while maintaining repeatability and quality, the company began to re-evaluate its manufacturing processes. It needed a system that would provide flexible mold making, better repeatability and greater efficiency in cycle times and labor. Initially, the SNC64 was joined with the EDGE3 sinker EDM in a robotic cell for lights-out operation. 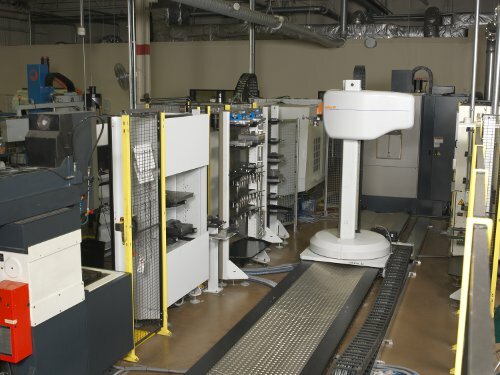 The success of this cell led to the development of a larger, more modular robotically managed cell that could grow with STRATTEC—this time incorporating the SNC64, EDGE3, F5 and two EDAF3 sinker EDM machines. This flexible mold-making system is programmed using Makino’s EDcam™ software. It coordinates between the CAM systems and the EDM machines, eliminating programming at the machines. STRATTEC’s mold manufacturing operation now performs graphite milling, hard milling and EDM capabilities all in one automated cell. This level of flexible mold making has brought improved part quality, higher productivity and lead-time reductions from days to hours in some cases. The company is able to meet part tolerances within tenths for perfect shutoffs and flush parting lines. The automated system is reliable and efficient. Programming errors have been reduced by 90 percent. The EDcam software helps the company manage its automated processes without mixing up electrodes. Jobs can be prioritized to run sequentially, simultaneously or have the order changed up due to urgency. Such prioritization is especially important since STRATTEC is often running 15 to 20 jobs in different stages of electrode development. STRATTEC is now able to run a single-shift operation that matches the volume of a three-shift business. This improvement has enabled the company to bring all of its jobs back in-house. With the cell controller managing workflow, operators simply load the cell to maintain the production queue. In fact, STRATTEC’s main challenge is simply keeping the machines fed.